On Sale Now! 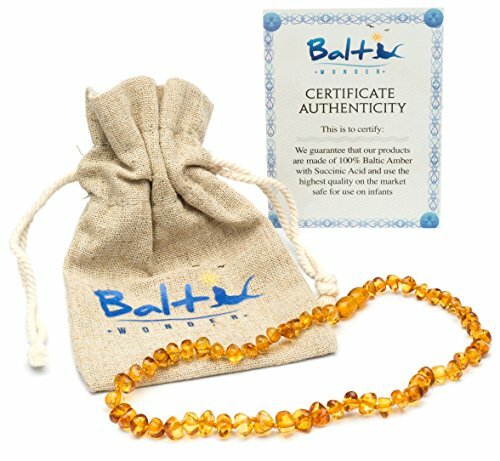 Save 4% on the Baltic Amber Teething Necklace For Babies (Unisex) (Honey) - Anti Flammatory, Drooling & Teething Pain Reduce Properties - Natural Certificated Oval Baltic Jewelry with the Highest Quality Guaranteed by Baltic Wonder at Spoil the Baby. MPN: 1. Hurry! Limited time offer. Offer valid only while supplies last. The Ultimate Amber Teething Necklace Our Amber Teething Necklace is the perfect alternative medicine for babies & toddlers on the teething process. *Moms first choice, thanks to the quality of our products and customer service satisfaction. Our Products have a 100% Money Back Guarantee (Valid for 1 year). If for any Reason You Are Dissatisfied with Your Purchase, Please Feel Free to Send Us a Message in order to Grant a Refund. Speedy Support with confidence! We Appreciate You for Choosing Baltic Wonder.